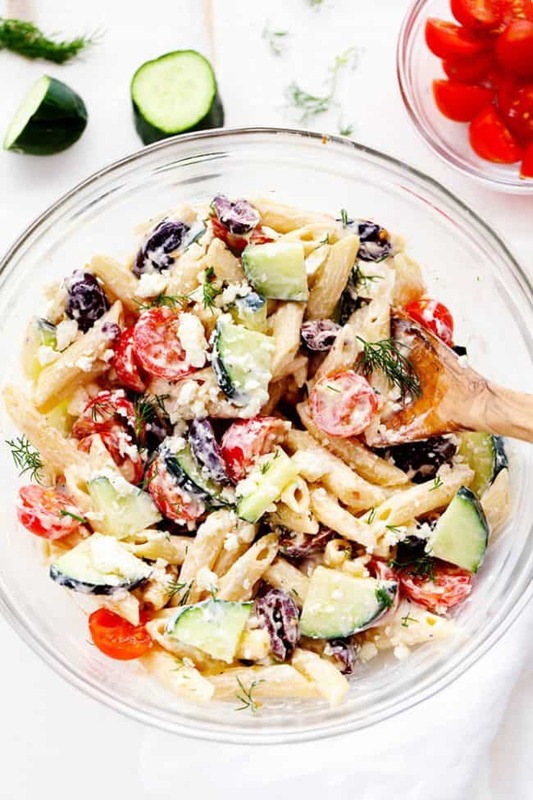 Greek Tzatziki Pasta Salad is a delicious pasta salad with fresh cucumbers, kalamata olives, and cherry tomatoes. It is tossed in a tangy tzatziki dressing and is perfect for your next potluck! It is getting HOT outside. And our AC has been running all day. Say hello to ginormous summer electric bills. I just noticed it is 78 degrees in our house which means the ac is probably going out. Hallelujah that we are moving into our new house next week! I am one of those people that keeps our ac at low temperatures and sleeps with the window open in the winter time. So I am dying that it is 78 degrees in here! Hot house+moving= I am going crazy! Although it is getting hot outside we are loving the summer weather! We have BBQ’s almost every night of the week. We love spending time outside. And pasta salads are always a must at any summer BBQ that we have. 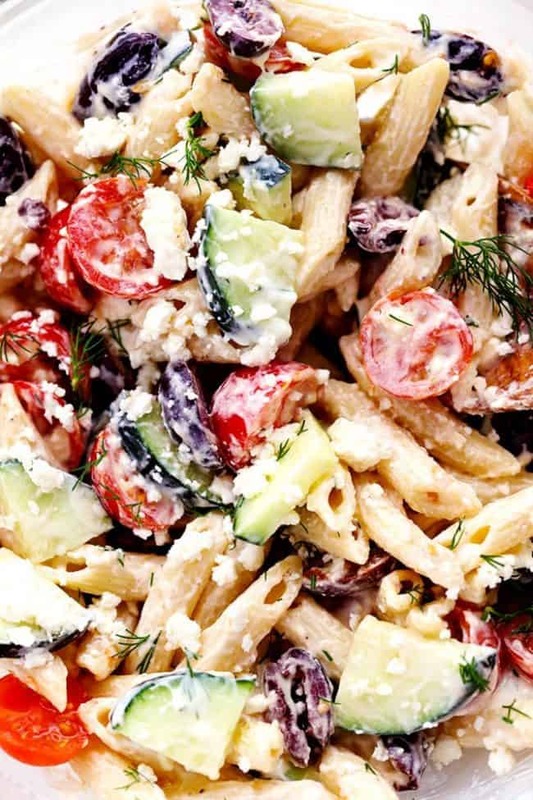 You guys are going to love this pasta salad. It has simple fresh ingredients and it is tossed in a tangy tzatziki dressing. This salad uses minimal ingredients. 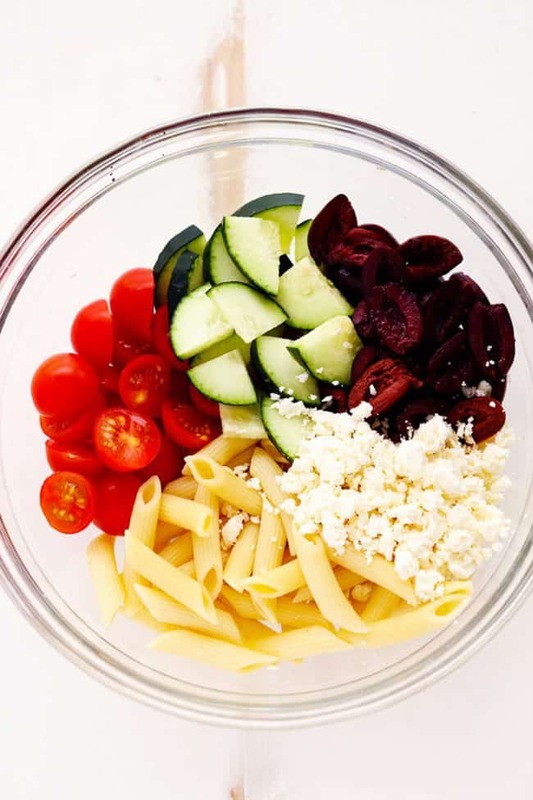 Pasta, crisp cucumbers, cherry tomatoes, kalamata olives, and feta cheese. It is full of such amazing flavor. 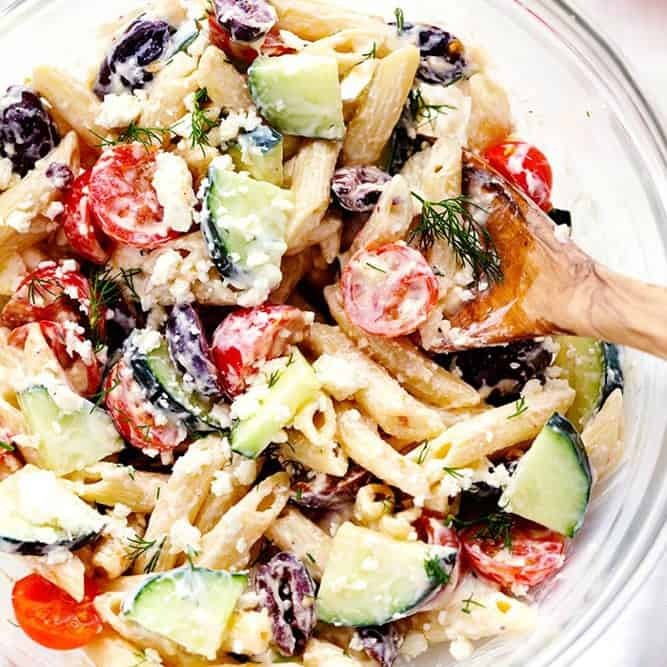 It is tossed in a tangy and creamy tzatziki dressing and is the perfect pasta salad! I love fresh dill and it adds a sweet flavor to the tangy tzatziki dressing. 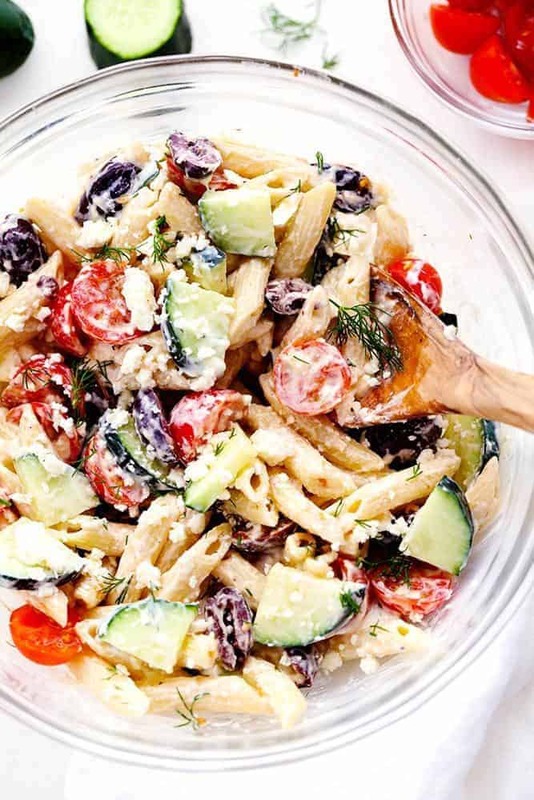 This pasta salad came together quickly and easily and it is perfect for your next summer gathering! How many servings does this make? Sounds fabulous!! can I use garlic powder instead? and is gluten free pasta fine for this recipe? Also, how long can this be stored in the fridge? thanks! and is the dil necessary? This was fantastic! I added cut up zucchini as well. I can’t wait to make this recipe again. Hi, recipe look delicious and can’t wait to try it. Great recipe! I’ve made it several times as per the recipe, and it’s great. I’ve also tweaked it by adding 1 1/2 cup grilled chicken breast (cubed) or pepperoni cubes! It’s great cold and a favorite of ours!